The cool guys behind Give Them Beer started their business in 2013. The inspiration came from one simple desire: they wanted to drink better beer. At first, they offered around 30 different craft beers, but quite soon, they managed to quintuple the number. Over the years, they have only grown stronger. Their beer gifts have reached the offices of numerous well-known corporations, such as LinkedIn, Snapchat, and ESPN. Read this honest Give Them Beer review to learn more. Give Them Beer offers only top-rated craft beers tucked into amazing gift baskets and briefcases, along with some ultimate beer snacks. They boast over 150 different beers, including ales, lagers, IPAs (Indian Pale Ale), porters, and stouts, as well as seasonal and specialty beers. Although all of these craft beer styles have numerous representatives in their selection, IPAs are the greatest in number, with over 40 different IPAs in the offer. They also offer a wide range of ales, with nearly 30 different craft ales available. 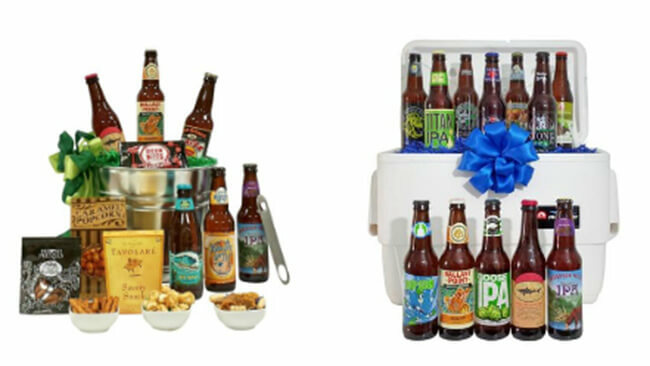 Although Give Them Beer gift baskets also feature beers that come from major breweries, such as Corona, Miller, Guinness, and Budweiser, most of their beers come from microbreweries – small breweries that produce beer in limited amounts. That is why their beers taste better than those bought in a store – they are not mass-produced and they are created with more attention and love. Give Them Beer brews are carefully selected by people who truly love beer. They come from all over the country, with the greatest number of them coming from California, Florida, and Colorado. Although they primarily feature beers made in the US, you can also find beers from European countries. Most of them are made in Belgium, but they also feature beers from countries like Ireland and England. 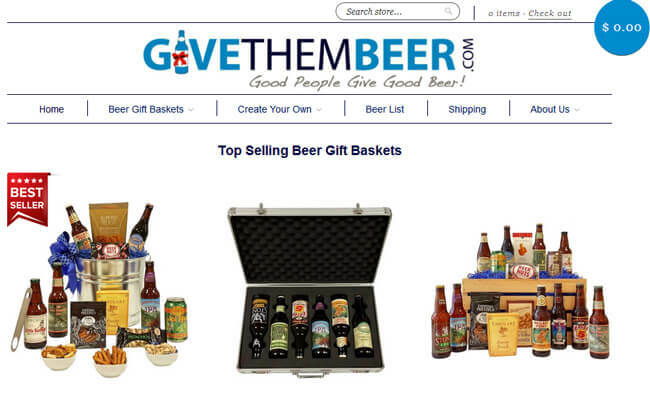 When they first started, Give Them Beer was the first beer gift basket website that exclusively offered craft beer. Unlike numerous other sites that simply provide you with familiar beers wrapped in a gift basket, Give Them Beer brings you the best craft beers available in the US. On top of that, they put a lot of effort into presentation. Apart from the delicious gourmet snacks, you get pretty cool and useful rustic crates that make for a great impression and can even be reused. Finally, if there is any kind of problem with your order, all you need to do is notify them. Due to various limitations related to alcohol shipping laws and the nature of the product, they cannot accept returns. However, in order to keep you happy, they will send you a replacement of the same or superior quality beer within 24 hours after receiving your complaint. Give Them Beer does not only make sure every gift they provide features only the highest-rated craft beers available in the US, they hand-pick everything that goes into the gift basket, creating the ultimate beer gift for any occasion. Gifts include beer baskets, beer boxes, 12-pack rustic crates, happy birthday beer cakes, and more. Apart from beer and the packaging, the recipient can also gets sweet and salty gourmet snacks, a personalized gift card, and sometimes even a stainless steel bottle opener, all tucked into a decorative fill. The beers are carefully placed into custom molds in order to prevent any damage. You can choose from around 30 different beer gifts. You can send a corporate gift, a birthday beer gift, a get well basket, a thank you basket or a sympathy basket. Of course, any of them can be suitable for a number of occasions. The prices of gift baskets range from $69.99 to $149.99 – the price of the ultimate Best Case Scenario beer basket. Birthday beer cakes and gift boxes normally cost between $74.99 and $89.99. 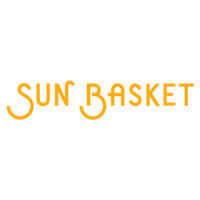 Brewery baskets range from $59.99 to $119.99. Shipping costs are not included in the price of the gifts. When it comes to shipping, there are 2 options: ground (1-5 days) and express delivery. Shipping costs for 12-pack beer boxes are $15 for ground shipping. For 24-pack beer boxes, the costs are $28 for ground shipping. Express shipping costs depend on various factors, including product and destination, and they can only be viewed at checkout. Give Them Beer ships all across the country, except for Alabama, Alaska, Kentucky, Hawaii, Mississippi and Utah, due to alcohol shipping regulations. At the moment, they do not ship outside the US. The gifts must be received in person and they do not ship to P.O. Boxes or APO addresses. If you wish to send to multiple recipients, you should send them an email so they could arrange such a shipment. If you want your gift to be shipped on a specific date, you can enter the desired date into the Future Ship Date/Delivery Instructions box at checkout and you will get a shipping confirmation once it is delivered. Give Them Beer does not offer 24/7 customer support and sticks to the usual means of communication with customers – phone and email. You can also send your questions directly through their website. Although they have not introduced any of the more popular solutions like live chat, they do promise to get back to you in no more than 24 hours and most of the time, they deliver on their promise. To make sure Give Them Beer meets all your standards and expectations, it is important to know its biggest advantages and disadvantages. With a short overview of its pros and cons, you can easily decide if Give Them Beer is the right company for you. Summing up this Give Them Beer review, we have to say that we are really satisfied with their offer. They bring you premium-quality craft beers along with some pretty nice extras, including snacks, bottle openers, and amazing packaging. They are completely transparent in terms of all costs, with detailed information on shipping, and they offer replacements for all gifts you are not satisfied with. Their customer support is not that impressive, but that is really the only aspect of their service that we found to be slightly disappointing. All in all, Give Them Beer is a great place for finding a creative gift for any beer lover. Our ratings are the result of an objective and independent evaluation of Give Them Beer, generating the final rating that reflects the overall quality of the company. Ratings may change as the service changes. Give Them Beer customer rating based on 6 customer reviews. Their website is misleading. READ THE FINE PRINT as, if you order a basket and "upgrade" all you will receive is the beer. Fine print, which I did not easily see, states an "upgrade" included 12 pk of beer plus themed accessories. Hardly worth the $88.00 I spent. All my friend received for his birthday was a box with 12 beers, no accessories and not the basket I intended to send. Customer service declined to remedy this situation. Almost $90.00 for a 12pk of Corona beer was definitely not worth the price. Will never use this site again and am investigating reporting options. DISAPPOINTING! When comparing the beers in the basket with what was listed in this basket on the website, only four beers are the ones listed. The other eight are not part of the Premium Microbrew Basket. While I understand some substitutions due to availability are possible, 66% of the beers in the basket are not what were advertised. I think you need to do better than that. That seems more like a variety pack of your choosing. I think that letting the customer know this is going to occur (more than half the order is substituted) and giving them the option to proceed or cancel would be more appropriate. 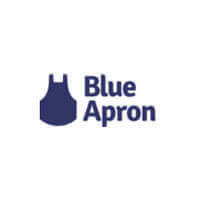 I would not order from them again base on this experience. Awesome beer, even more awesome briefcases, and the prices are really reasonable. Will be shopping here again for sure. These guys really know good beer! And the gift looks incredible, great job! Bought a gift bucket for my man, he loved it! The shipping could be cheaper though, couldn’t it? Bought myself a gift, ha-ha, the beer is real good, the snacks not so much. We found 0 verified Give Them Beer discounts for April, 2019.